May 2017 – Next Hipster Trend is what's HAWT, NEXT! Next Hipster Trend is what's HAWT, NEXT! Your fingers have been appropriated, and so has your brain! 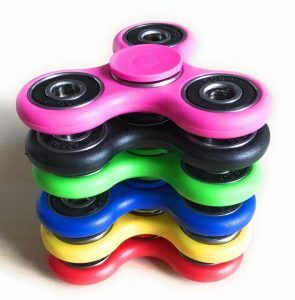 The next time Theo plops down at the marketing meeting, shifting around annoyingly in his swedish productivity stool, and whips out some odd piece of plastic to idly flip around in his hand, you have our full permission to reach across and pebble grab that thing. The fidget spinner is HAWTNOT! Hell, even Gloria the apple lady at the farmers market has one. Okay, okay … we all know that some people have difficulty keeping focused and that there are clinical diagnoses which define the issue but that’s no right to infect the rest of the office with your distraction devices. HOW2NOTHAWT: If reaching across a table and grabbing your co-worker’s self-prescribed ADHD accommodation is too much personal space invading for you, here’s the perfect next level response. Butterfly Knives! Becoming a butterfly knife master is Napoleon Dynamite level hawt and a most envied skill for every Hawtster. Oh, there will be cuts during your training and there will be blood. But … there will be ultimate satisfaction when you whip out your dragon/monarch engraved Philippine razor sharp blades and, in a blurred flurry of steel and panache, turn the social media analytics report printouts into a cloud of confetti (they were trending down anyway). “Sorry, I was losing focus,” you can coolly claim as you glare at Theo and his asinine brightly colored toy. The video below should get you started, you’ll need to bring your own soundtrack to the meeting. Copyright © 2019 Next Hipster Trend is what's HAWT, NEXT!.